Volunteers with IndyCAN listen to a presentation by Shoshanna Spector, executive director of the organization. Emerging research suggests he’s right. Having a parent behind bars can poorly impact a child’s behavioral, emotional and even physical health. A new community-led research project in Indianapolis seeks to understand that link more clearly. Indiana has some of the highest incarceration rates in the country. More than 1 in 10 Indiana children have a parent who has been incarcerated, the second highest rate in the nation. Recent research has focused on how this loss can impact children’s health – mind and body. The research project is a partnership between a community leader Shoshanna Spector, executive director of the Indianapolis Congregational Action Network (IndyCAN), and two academic researchers, Tomlin, who is the director of the Riley Childhood Development Center at the Indiana University School of Medicine and Karen Ruprecht, director of research and practice of Early Learning Indiana. The study is being funded by the Robert Wood Johnson Foundation as part of its Interdisciplinary Research Leaders program which supports teams of researchers working together with community leaders. The researchers seek to determine what health consequences Hoosier children and families are experiencing because of an incarcerated parent. They will also study and recommend solutions. “People might immediately think mental health problems but the research is showing that children can have physiological effects that persist into adulthood like heart problems, shorter life expectancy and so on,” says Tomlin. Tomlin says having a parent incarcerated can be a child’s first strike against them. “So if you think about it, everything is related back to those early relationships and safe environments,” says Tomlin. Besides the loss of that connection, a parent going to prison or jail can also mean the loss of income and the stigma of incarceration can make it difficult to connect with resources. “When one parent is incarcerated it does make it harder for the family that is left behind and there is some evidence that standard of living is lowered. One parent is doing the work of two and support can make a difference,” says Tomlin. 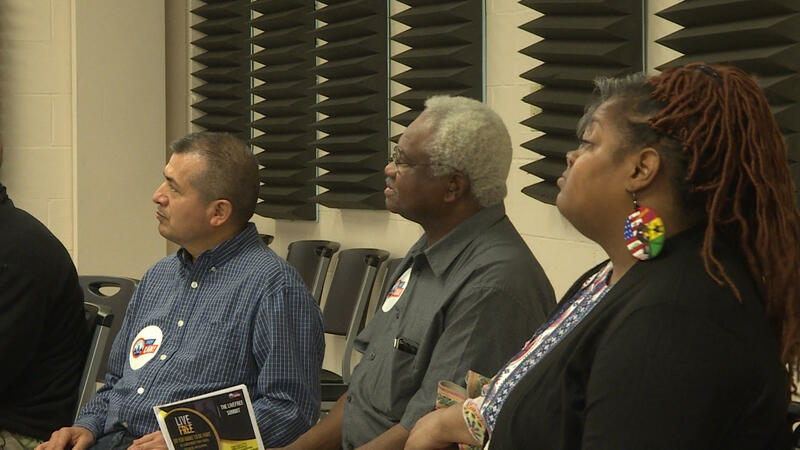 The project kicked off last month when about 75 community volunteers gathered for a summit calling for an end of mass incarceration in Indiana. IndyCAN, hosted the event to inform and empower attendees to take action. Earlier in June, researchers launched the project in earnest in congregations across the region. A team of volunteers are currently working to identify 1,000 people impacted by the absence of a family members in an initial pass and conduct more in-depth interviews with 250 people about how the absence has harmed the health of the family, especially children. Shoshanna Spector, executive director of IndyCAN, speaks to a group of volunteers about mass incarceration. Spector, IndyCAN executive director, says incarceration should be a last resort not a first response. “No child should be afraid that they will never see their parents even if it’s just six weeks or six months when there are plenty of alternatives,” Spector says. Alternatives like treatment and diversion strategies like crisis intervention. Spector says if communities don’t commit to reducing the number of people being incarcerated, the cycle will just continue. “In a state where we lock up one in three African American men compared to 1 in 273 whites – we are traumatizing people for generations” Spector says. The U.S. is the world leader of incarceration rates and Indiana has a 7 percent higher rate than the national average. In parts of the state a drug conviction can lead to decades in prison. Some evidence points to the relationship of mass incarceration and racial health inequity. Black teens in Indiana are twice as likely to have a parent in jail as whites. Terrell Harris’s wife served 10 years. She went to prison when her son was 2 and got out when he was 13. A lot says Harris. And that resentment and stress has led to health problems. “He suffers from PTSD and ADHD because he’s been in these messed up situations and he doesn’t know any better so he thinks, ‘OK, this is cool, I can be a gangster,’” Harris says. Tomlin, the research project’s psychologist, says that’s typical. “Stress over time can build up and what we’ve been finding is that stress can persist into adulthood,” she says. The group hopes to present their findings to the Indiana legislature next year.